PhonePe Just Signed Aamir Khan As Their Brand Ambassador And There Couldn’t Have Been A Better Fit! A) You don’t have to wait for off-days to visit the bank. B) That one friend cannot get away from splitting the bill anymore coz he “doesn’t have cash”. C) You find yourself sitting completely confused with 10 different apps on your phone, wishing there was just 1 to do the job! And with the increasing amount of issues millennials have to deal with, it’s easier with someone having our backs! PhonePe understands our problems and has thus welcomed Aamir Khan into the family and honestly, there couldn’t have been a better fit! 1. He is a complete package! An actor, director, storyteller, entertainer, producer – Aamir has always gone way beyond every idea (read: limitation) people have about him. He doesn’t just stick to one thing; he brings everything under one roof! PhonePe is to Fintech what Aamir is to Bollywood! It’s apps-in-app feature has got everyone covered from hard-core savers to foodies, travel enthusiasts, and the shopaholics. 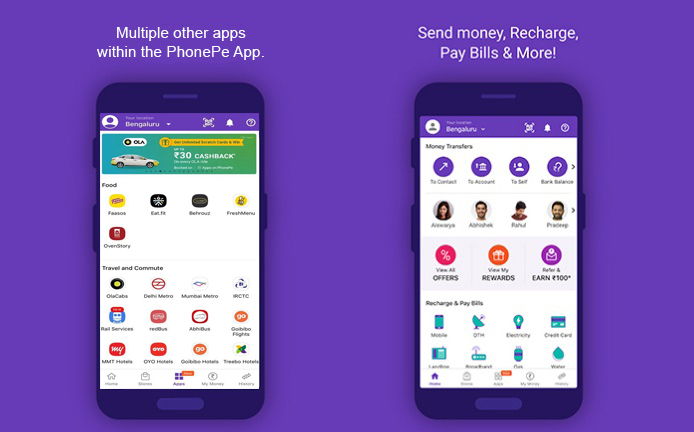 You can find apps of all categories within the PhonePe app – multiple apps within one app. Genius! 2. Here’s the one thing we all dread – making online payments! While being able to draw or transfer money digitally might seem like the ideal thing for “time-saver” aka sloth-bear, digital payments draw a lot of concern when it comes to submitting bank account/ATM card details. What if it nastily cheats you like your ex in 8th grade? But UPI makes everything easy! PhonePe’s UPI feature comes with immediate money transfers to doing away with unnecessary bank details, and it guarantees you the security you’ve been looking for! Also, Aamir has not just won our trust over time but has proved his credibility and dedication damn straight right? So if he trusts PhonePe, then we can be sure that it’s the real Sikandar in town! 3. Suddenly our smart minds turn stupid on hearing these two words – digital payment! But Aamir has a tradition of making his audience smarter. Because of him, we all know what dyslexia is, that success follows when we love what we do, and that many people use religion to fool us in the most bizarre ways, amongst many other things. Just like him, PhonePe through its latest ads educates us about UPI – how it’s safe, secure, and a major step ahead in how we deal with money. Also, did you know that you could use the app to pay offline merchants as well? Well, PhonePe taught me that! 4. What comes to your mind when I say ‘cricket’? Of course you’d think Tendulkar, but you also cannot miss Lagaan! Hence, PhonePe has taken it up a notch and is now an official co-presenting sponsor for the television broadcast of VIVO IPL 2019! Knowing the kind of die-hard cricket fans we can be, PhonePe is running a contest where a lucky winner gets a chance to Win A Trip* to watch Team India play in England this summer. All you have to do is make a UPI transaction on PhonePe anytime through this T20 season! So get up, let go of your fear, educate yourself, adult the right way, and make ‘money’ easy by downloading the one app for all your needs!